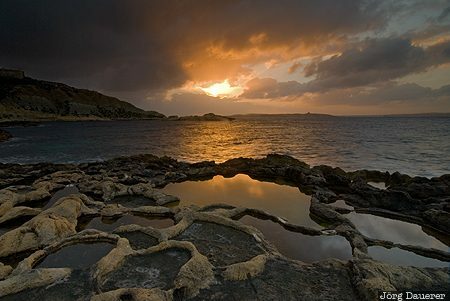 Colorful sunrise clouds and their reflexion in the calm waters of typical salt pans or salterns at the southern coast of Gozo near Ghajnsielem. Ghajnsielem is in the east of Gozo. Gozo is an island in the Mediterranean sea that belongs to Malta. This photo was taken in the morning of a sunny day in March of 2009. This photo was the image of the month in October of 2016. This photo was taken with a digital camera.